Libraries Beyond Their Institutions: Partnerships That Work illustrates the remarkable range of cooperative activities in which libraries are engaged in order to provide the best possible service. Increasingly, librarians recognize the need to link their institutions to the world around them as part of their obligation to enhance the integration of digital information, not only for students in academic settings, but also throughout all levels of society. An excellent companion and complement to Libraries Within Their Institutions: Creative Collaborations (Haworth) from the same editors, this unique book examines the variety of ways librarians work with community organizations, government agencies, professional organizations, minority communities, and city governments in their efforts to serve not just students in academic settings, but all of society. Libraries Beyond Their Institutions: Partnerships That Work reflects the growing understanding of the key role played by libraries in the development of civil society. 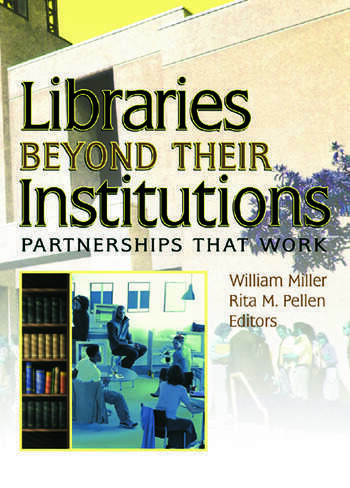 This unique book examines the variety of possibilities for collaborations outside institutions, including the ways librarians function in a variety of other campus settings, such as writing centers, teaching excellence centers, and academic departments in support of teaching, learning, and research; partnerships with graduate school, and information resources management to preserve theses and dissertations electronically; promoting civic partnerships; initiating a campus-wide information literacy resource; and partnering with government agencies to form a data literacy program. Libraries Beyond Their Institutions: Partnerships That Work is an invaluable resource for librarians working in academic, school, special, and public settings, and for library science faculty and students.